One of my many iterations of our vegetable garden layout was this simple potager style garden layout. It features two entrances. 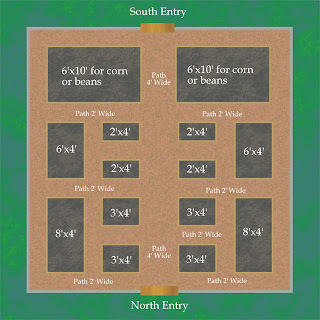 There were two large beds for corn and beans that were planted directly in the ground while the rest of the garden used raised beds for growing crops. In Tennessee our soils tend to be filled with clay and rocks which doesn't make for a wonderful garden but with raised beds we can overcome those issues. Crop rotation is easy to accomplish with this many beds. I would recommend using fewer but larger beds. Combining the 2'x4' vegetable beds into one 6'x4' bed would add several square feet of gardening space. Also here are 11 Things to Think about if you're considering a new raised bed vegetable garden.